I got the new LED bolts in the mail yesterday. They seemed to be of a greater quality than the ones that burned, and I kind of like them being black instead of the regular metal finish. Today I installed them which was a breeze. 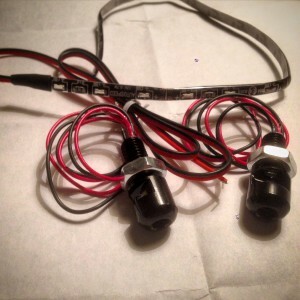 I had to drill the mounting holes a bit since these ones were M8 compared to the M6 of the last ones, and solder connectors to the wires but they worked and installation is now easy to reverse, should I switch to the LED strip with side light that I also bought. I did a bit of hand sanding the skateboard today too. It takes forever but I guess I’ll be able to get to that perfect fit this way. Besides, my lack of power tools doesn’t leave much choice. The first soft layer of the seat is cut now too. It’s the wrestling/dojo mat. Easy to cut, soft yet stiff and a perfect way to get some volume to the seat. 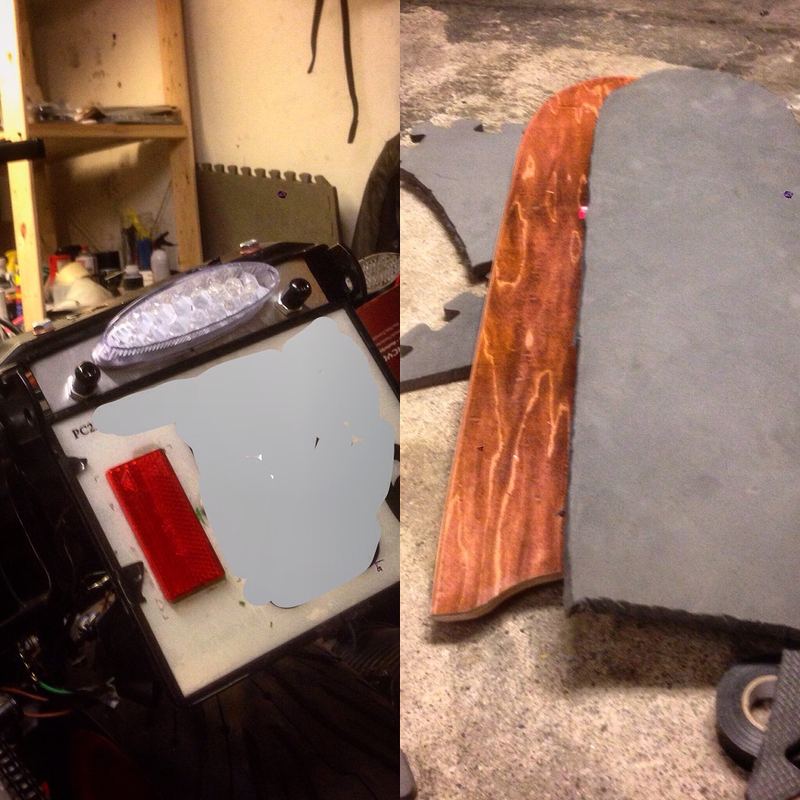 I brought the setup with me home to cut the top two layers of closed cell foam and start working on the fake leather cover but that won’t be mounted until I’ve fabricated a metal seat pane to attach to the skateboard so the mounts can be welded, or at least bolted, on.